The festive Christmas season is almost upon us, bringing with it the warming scent of mulled wine, the twinkle of fairy lights, and the merry sound of carol singers. It's the best time of the year if you ask us, and there's no better way to soak up the festive spirit than at one of Europe's many amazing Christmas markets. With each town and city offering something slightly different, there are countless markets across the continent spreading local festive cheer that are guaranteed to get you in the holiday spirit. We've whittled it down to 14 of the best spots to visit this winter, from the biggest city-based markets, to small-town affairs, so there's something to suit everyone. We've also added in some great hotel recommendations within walking distance of each market to get you inspired, and there are loads of other options available through the LazyTrips website too. So add your favourite destination to the planner and start organising the ultimate Christmas market holiday. Christmas markets are synonymous with their country of origin, Germany, so what better place to start than Cologne, where there are actually seven different markets to choose from. 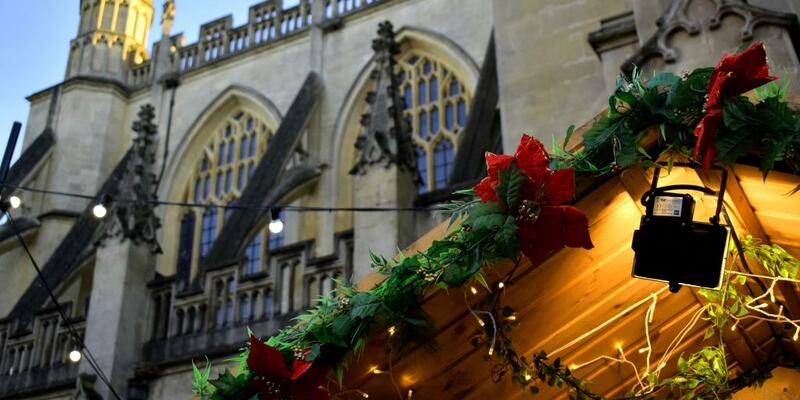 Although the one in the shadow of the cathedral is suitably atmospheric, we'd recommend visiting Angel's Christmas Market instead. As the oldest in the city, this offering is traditional and beautifully decorated with a canopy of twinkling stars hanging over the stalls. One of this market's highlights is the flock of angels which waft through the rows, sprinkling glitter and spreading Christmas cheer. Oh, and not forgetting Santa's weekly grand entrance on horseback. It has an injection of theatrical flair without feeling garish or tacky, and has a really magical feel about it. 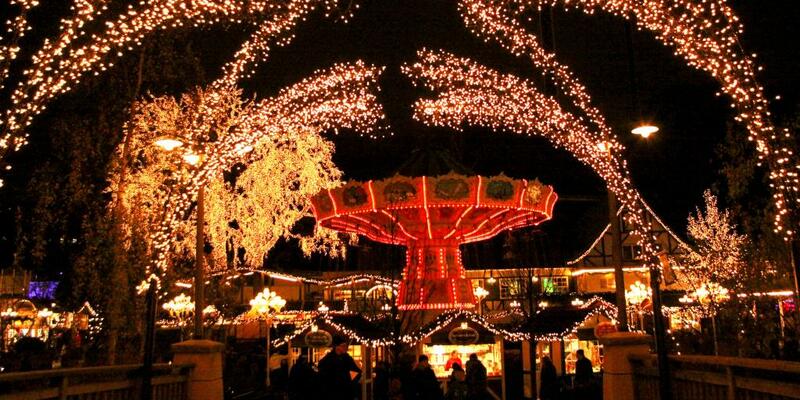 Taking place in one of Scandinavia's biggest amusement parks, the main Gothenburg Christmas Market forms part of the Christmas at Liseberg event, which sees the whole park transformed into a crazy (in a good way) winter wonderland. When we say crazy, we mean it: think five million lights, carousels, ice ballet, carol singers, and a full-on Santa's workshop, on top of a whole load of market stalls selling arts and crafts and festive foods, including traditional Swedish herrings, marzipan pigs, and glögg (spiced mulled wine). Despite how it sounds, this Gothenburg market doesn't feel over-the-top or at all commercial and trashy - far from it. It's actually super beautiful and heart-warmingly festive, with its charming red and white huts sheltered by the park's many trees, and illuminated by the soft glow of fairy lights and fire pits. Alright fine, there may be an element of Christmas overload here, but isn't that the best way to get into the Christmas spirit? Where to stay: Liseberg Heden Hotel - This hotel is within walking distance of the market and has chic, comfortable rooms including family suites. Access to the gym and sauna are included in the price of the room, and there are loads of great facilities for children if you're travelling as a family. Some of the market's highlights include the Chilli Alchemist, a stall selling fiery chilli sauces in retro apothecary bottles, and Wolfe Academy clothing, an independent brand selling cool outdoors-inspired apparel. Where to stay: Royal Crescent Hotel and Spa - Splash out and stay on the famous Royal Crescent in the heart of the city. The rooms here have a luxurious, cosy feel, either overlooking the crescent green or the hotel gardens. Each room is unique, elegant, and homely, with a luxurious onsite spa and award-winning restaurant for you to enjoy. 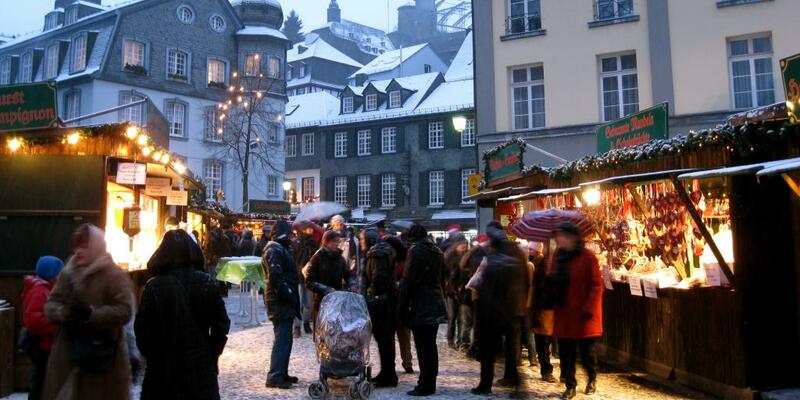 Snow typically begins to fall in Monschau in November, just in time for the opening of its annual Christmas market. The town is extremely picturesque as it is, with charming half-timbered houses and cobbled streets, but the scenes are off-the-chart when the little wooden huts, fairy lights, and Christmas cheer join the dusting of snow. The market itself is small, but beautiful and traditional - there's nothing gaudy or commercial here. Instead, expect to indulge in classic bratwursts, gingerbread, and mulled wine whilst you browse handmade decorations, crafts, and unique gifts, all the while being softly serenaded by traditional trumpet players. There is also a beautiful living Nativity scene beneath the towers of the church, which is the icing on the Christmas cake. Where to stay: Michel & Friends Hotel - Just a short walk to the market, this casual hotel will cater to your every need, and has simple and delightfully modern rooms. There is a great bar and pool for relaxing in the evenings, and it provides an easy base to explore the town and Christmas markets. If you're after the ultimate dose of Christmas spirit but don't fancy braving freezing temperatures, then the Artisan Market in Seville is ideal. Okay, so it doesn't stay as toasty as in the summer months, but the temperature rarely drops below 12 degrees Celsius in December, making it optimum conditions for some market browsing. 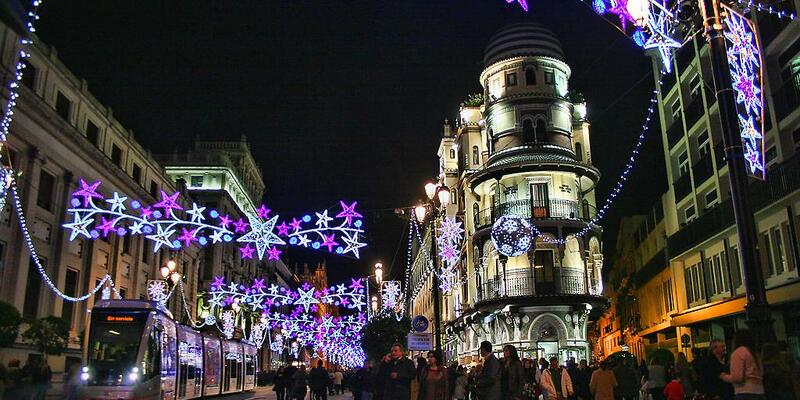 Plus, there's heaps of festive charm in the market and around the city that more than makes up for the lack of snow! This traditional market coincides with the celebration of the Seville Artisan Federation, so these stalls are a salute to all things handmade in the city. The booths are super chic and modern and sell items including brightly-painted ceramics, sleek leather handbags, and stylish jewellery. Although this market isn't your traditional wooden-hut-and-mulled-wine affair, it's still a jolly, festive spot for some unique gift-buying. Where to stay: Hotel Posada del Lucero - Situated very close to the Plaza Nueva, this hotel's chic and modern rooms surround a traditional Andalucian courtyard, giving it an authentic feel. It also has a trendy rooftop terrace with a pool which is open all year round (at room temperature). Christmas is taken seriously in the Scottish capital, with a whole host of festive delights popping up all over the city including fun fair rides, ice rinks, shows, and of course Christmas markets. 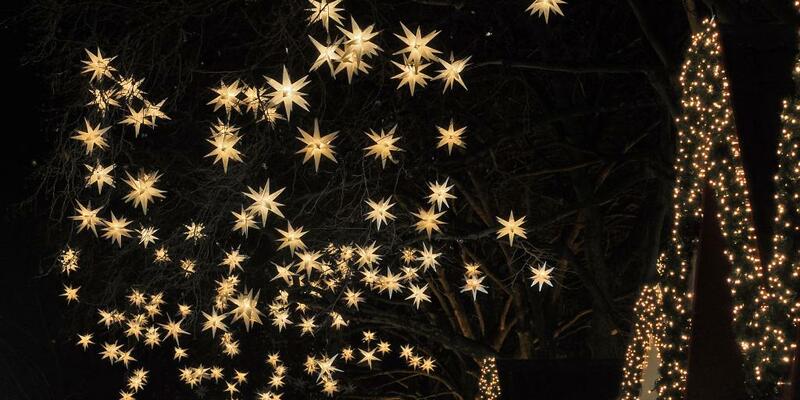 Our top pick in Edinburgh is the European Christmas Market in East Princes Street Gardens - also known as the German Christmas Market - which brings together more than 100 stalls celebrating Christmassy culture all over the continent. 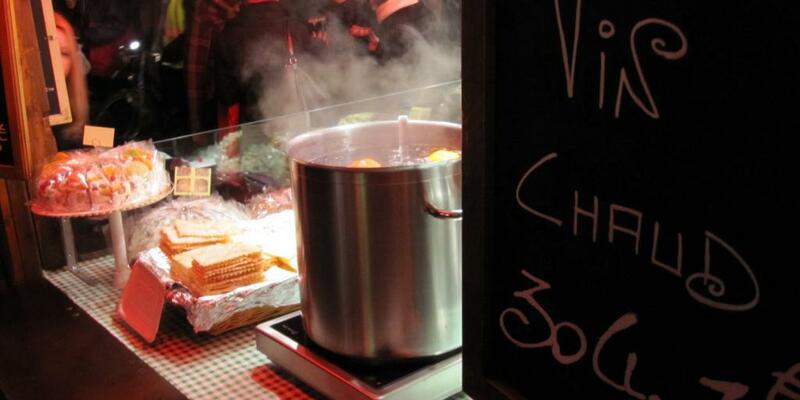 Grab a mulled wine and make sure you hit up every stall to make the most of this unique gift-buying and snack-munching experience. East Princes Street Gardens is also home to The Edinburgh Flyer (pictured below), a nerve-wracking ride that spins you high above the park, and the iconic big wheel which is a somewhat less scary way to get up high above the action. 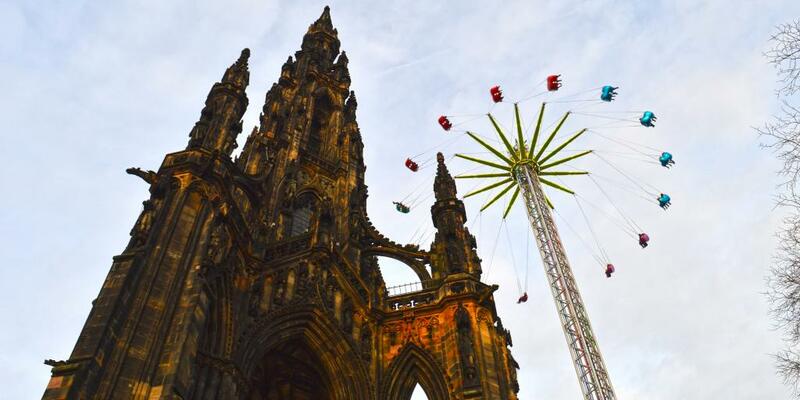 Once you're done perusing the market stalls, why not brave one of these rides for a new perspective of festive Edinburgh? If you'd rather something a bit closer to home, there is also a Scottish Christmas Market in St. Andrew Square selling loads of local gifts, as well as items from across the country. Where to stay: The Glasshouse Hotel - This hotel is just a few minutes' walk away from Princes Street - one of the most festive areas of the city and the location of the market. The luxurious rooms have floor to ceiling windows with spectacular views of the city, and are furnished in a simple yet modern and elegant way. Known as a summer holiday hot-spot and Game of Thrones filming location, Dubrovnik may seem an unlikely Christmas destination, but it's actually a really festive and atmospheric option for a winter break. The Stradun (main street) is lit up with the romantic golden glow of fairy lights, transforming into a beautiful Christmas market selling local treats including fritule (sugared doughnuts) and candied orange peel, as well as beautiful gifts made by local traders. The dramatic medieval walls make Christmas here feel even more magical, especially because so much care is taken in decorating the streets with wreaths, oranges, Christmas trees, and flurries of fake snow. Plus, it's pretty quiet here in the winter, so it's the ideal market to visit if you want to avoid the usual Christmas crowds. Travel tip: If you plan to stay for Christmas Eve, locals join together to sing traditional carols - a lovely way to see in Christmas Day. Where to stay: Apartments Eleganca - Keep your independence and book one of these cosy and bright apartments just off Stradun. You can choose between an apartment or a studio, both of which have a kitchen and living area as well as bedroom and bathroom. The fittings are modern, but the exposed brickwork and big windows give the space some old-town charm. Often referred to by the locals as 'Merry December', the festive season in Ljubljana is treated like a true community event, and the ideal place to bump into old friends and have a catch up. The whole town is dressed up in pretty lights, but the Festive Fair is one of the true stars of the show, lining the banks of the Ljubljanica River with decorated wooden stalls and sending the smell of kuhano vino (Slovenian mulled wine) and roasted chestnuts through the air. 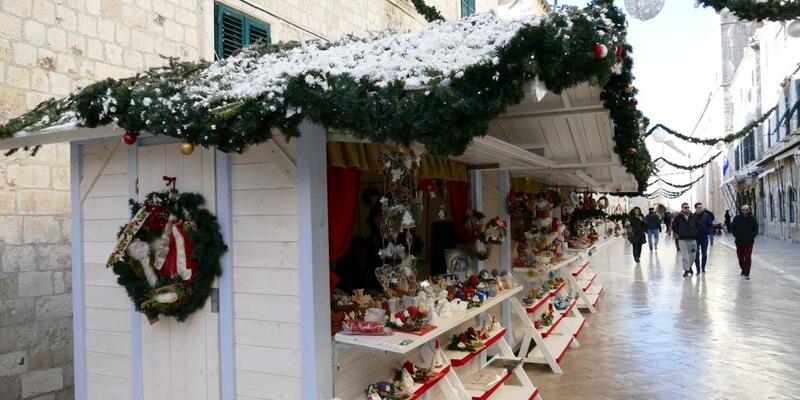 For a touch of Christmas magic, pay a visit to the Good Fairy in Mestni Trg Square in front of the Town Hall to have your biggest wish granted, or just browse the huts, treat yourself to some festive treats and soak up the friendly atmosphere. Where to stay: Antiq Palace Hotel and Spa - This 16th-century palatial residence in the heart of the city has individually designed boutique rooms which feel both luxurious and traditional. There is also a great spa onsite for some pampering. If you're mad about Christmas, Prague is the ultimate destination for all things festive; I mean, the fact that it's the birthplace of Good King Wenceslas already takes the festive factor through the roof. The market in Old Market Square is definitely the biggest and most popular, offering daily carol concerts, countless stalls, a lovely nativity scene, and a huge Christmas tree, making it the ultimate merry destination. The food at this market deserves an extra special mention, and certainly isn't for those on a diet! The smells alone of local delicacies including klobása (grilled sausages), Pražská Šunka (a famous type of roasted smoked ham), and Palačinky (a kind of pancake) are divine, not to mention Trdelnik, a spiral of dough cooked over a grill and coated in sugar and cinnamon. 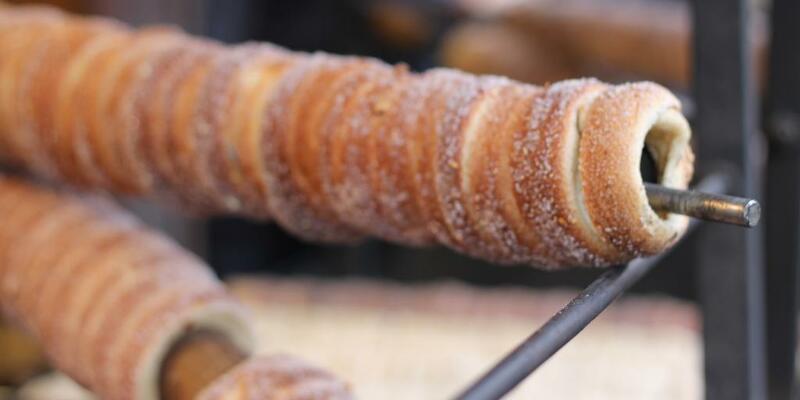 If you've got a sweet tooth and you only try one thing, it has to be Trdelnik. Where to stay: Smetana Hotel - Located in the old town, this hotel has a luxurious, regal feel, with ornate artwork and traditional touches making it feel authentic, yet comfortable, bringing the character of the old town into your room. Spa treatments, personal training, and the 'Bistro Bohemian Rhapsody' restaurant are also available for a memorable stay. 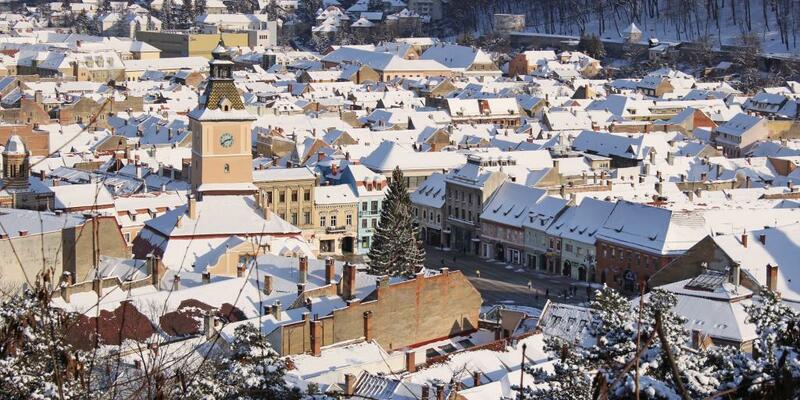 Brașov is about as close as you'll get to a fairy tale city, especially at Christmas - when the already-beautiful main square is dotted with a handful of wooden huts and an enormous twinkling Christmas tree. 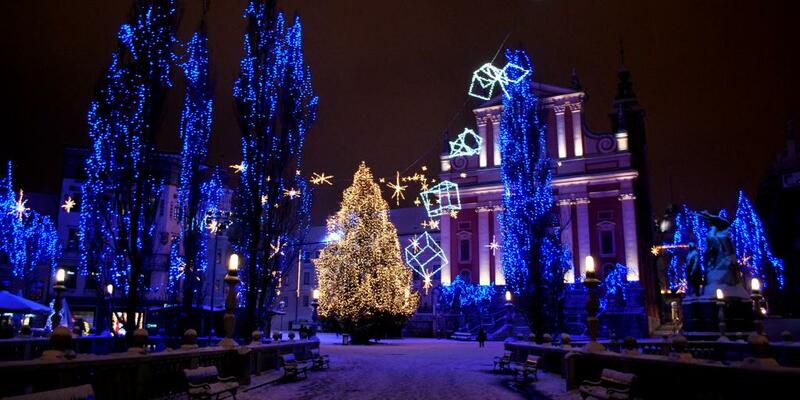 Christmas markets are a relatively new addition to Romanian culture and have become happily rooted in its winter rituals, so much so that the fair in Brașov recently began inviting traders from Linz in Austria and Nuremberg in Germany to their market, bringing even more festive cheer to this small city. Whilst this market may not be on the same scale as those that take place in some of the bigger European cities, it more than makes up for its modest size with its incredibly festive vibes; expect traditional performances, carol singing, folk dancing, and music recitals all adding to the atmosphere as you browse the stalls in this beautiful winter wonderland. Where to stay: Annapolis Residence Central - This hotel offers simple, un-fussy rooms close to the square with great views of the Black Church. The interior is decorated in an Art Nouveau style, and even the deluxe rooms are super affordable, so go for a flashier room to get a spacious lounge area thrown in. Known as the 'Capital of Christmas', we couldn't not include Strasbourg in our top festive Christmas market picks. Originally part of Germany, the region of Alsace which Strasbourg belongs to out-does the rest of France, still paying homage to the German Christmas spirit that is so loved throughout Europe. Strictly speaking, we're not talking about just one market in Strasbourg, but rather 11, all located on the central Grande-Île with some only 50 metres apart. The market exploring here, then, is pretty endless, however there are a few that deserve some special attention, the first being the largest market in Place Broglie. Held on the site of the original 16th-century Christkindelsmärik, there are over 100 stalls in this square selling pottery, jewellery, handmade toys, and some of the best vin chaud (mulled wine) around. The market in Place du Château is our second pick. This smaller market is surrounded by charming half-timbered houses decorated with figures and garlands, and is a slightly quieter, but no less scenic, option for some festive browsing. Hit up these two great options, or go rogue and try to visit all eleven - either way, there's no shortage of Christmassy stalls to visit in Strasbourg. Where to stay: Régent Petite France Hotel & Spa - located on the edge of the Grande-Île in the historic La Petite France area of the city. Each room has a lovely view of the quaint streets, the river, or the timber-framed houses. The hotel is full of character and each room is unique, with impressive marble bathrooms and inviting bathtubs the perfect antidote to that wintertime chill. The Helsinki Christmas Market, or Toumaan Markkinat, is the oldest and most popular in the city and is located in the beautiful Senate Square, a hub for events and festivities throughout the year. Overlooked by the picturesque white neoclassical cathedral, this is a lovely setting for the 100 stalls that call this square home for most of December. As with most Christmas markets, Helsinki's focuses mainly on great food, local gifts, and a celebratory atmosphere, but with a few unique quirks that make it stand out from the crowd. 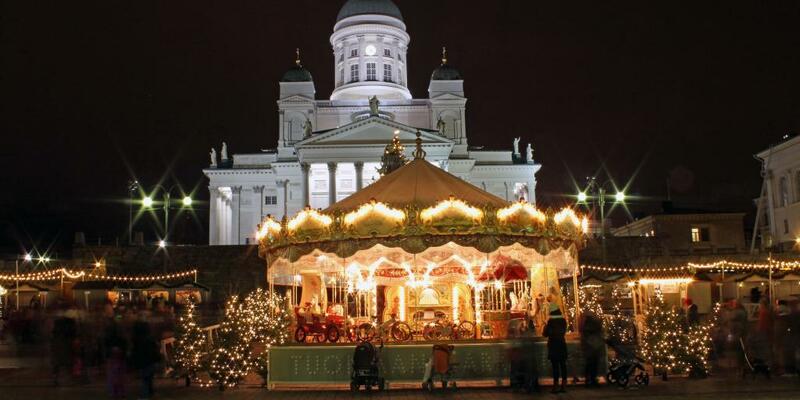 There's a nostalgic 100-year-old carousel offering free rides to children, the world's only Christmas market sauna at the foot of the cathedral, daily visits from Santa Claus, and stalls selling amazing Finnish produce as well as pre-prepared snacks and treats. Don't know about you, but that sounds like cosy, Christmassy heaven to us! This market is clearly full of love and local Christmas spirit, so it's definitely worth the trip for the warmest of festive hugs in the middle of this chilly city. Where to stay: Hotel St George - located in the heart of the city by the Old Church Park, this hotel is only a few streets away from the Christmas market. The rooms are luxurious but at the same time so homely, with lots of cushions, blankets, and pictures hung on the walls (the attic rooms are particularly pleasnt). There are also two restaurants, a bakery, a Monocle shop, and a spa, making your stay extra special. Visiting Bruges at Christmas is like walking into a scene from a Christmas card, and the main Markt Square is the centre of it all. Expect an ice rink, decorated medieval buildings, and, of course, the market. 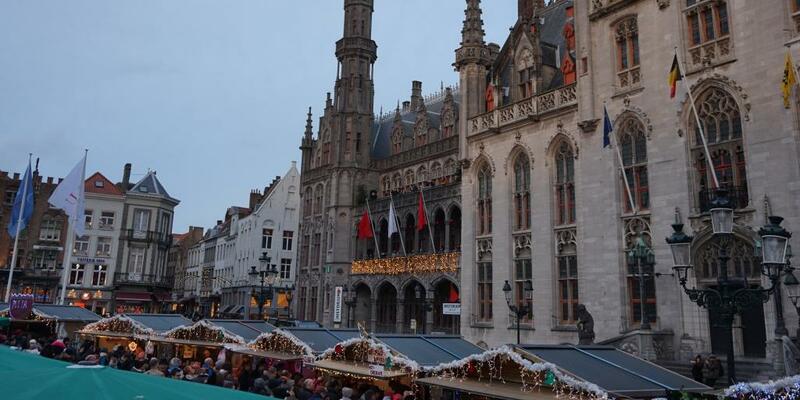 Here they sell classic handmade gifts, decorations, and local delicacies, all set against the backdrop of the stunning Belfry of Bruges tower. One of the main stars of the show in this market, and a quintessentially Belgian treat, are the crisp waffles covered in warm chocolate sauce. Bruges is also famous for lace-making, so if you're after an authentic gift for a loved one, something lacy is the way to go. There is also a second Christmas Market just a short walk away in Simon Stevinplein Square, which has even more great food and crafts. Plus, this square is home to one of Bruges's legendary chocolatiers the Chocolate Line, where you can watch cocoa beans being transformed into delicious bars and bite-sized chunks in loads of crazy flavours (seriously, they sell fried onion, bacon, and wasabi flavoured chocolates!) Definitely sneak away from your friends and family as they browse the stalls to stock up on some tasty stocking-fillers,as well as a bar or two for yourself, obviously. Where to stay: Hotel Jan Brito - This converted 16th-century manor house is a quiet, romantic spot just 200 metres from the market square. Its luxury mansion feel has been retained in its grand bedrooms, with chandeliers, exposed beams and patterned wallpaper adding a touch of glamour. Some of the rooms are small, and whilst they're all really nice and comfortable, treat yourself to one of the suites, if you can. 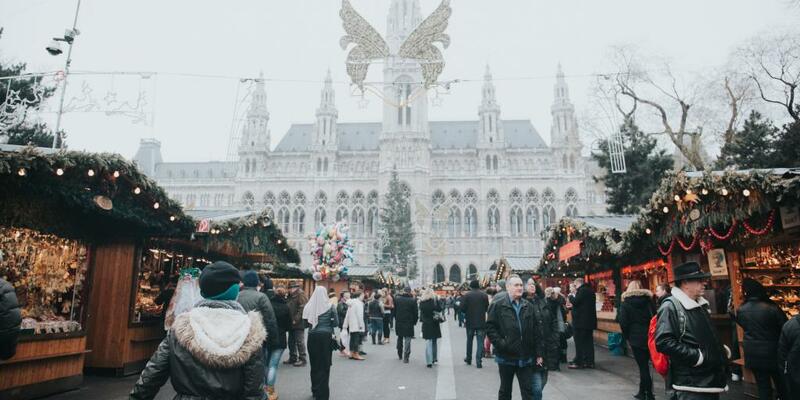 Nothing deserves to round off our top Christmas market picks more than the Viennese Christmas Market in the City Hall Square in Vienna. Literally known as 'Vienna Christmas Dream', the square becomes a winter wonderland with a giant tree, loads of lights, twinkling stalls, and a massive ice rink for loads of jolly fun. Okay, so we can't deny that this is probably the busiest and most touristy Christmas market in the city, and there are other ones you can opt for instead, however it's worth noting that the Viennese government have worked hard to make sure the market is tasteful, not tacky. One great example of this is the fact that disposable cups are not generally used here; instead, you can buy a Christmas-themed mug for your punch or hot chocolate then take it home as a souvenir, or return it for your money back - a brilliant waste-free idea highlighting the care and attention paid to the market. For a sweet treat here,definitely opt for a classic Austrian apple strudel or a schaumbecher, an ice cream cone topped with a swirl of marshmallow and dipped in chocolate. We'd also recommend hitting the ice rink at some point during your visit - it looks amazing when it's lit up in the evenings, and you can request your favourite songs as you skate your way around. Magical. Where to stay: Le Méridien Vienna - Just a short stroll from Rathausplatz, this hotel is chic and modern, and also a bit quirky and arty with bold prints, spa facilities, a roof terrace and even a Champagne bar - this is where you can really do Christmas in style.